Usually wears a brown vest, but removes it when he fights. -Magical power called "Heat Edge". In reality, he can accelerate the vibrations of particles (in Old World, such terms probably don't exist). 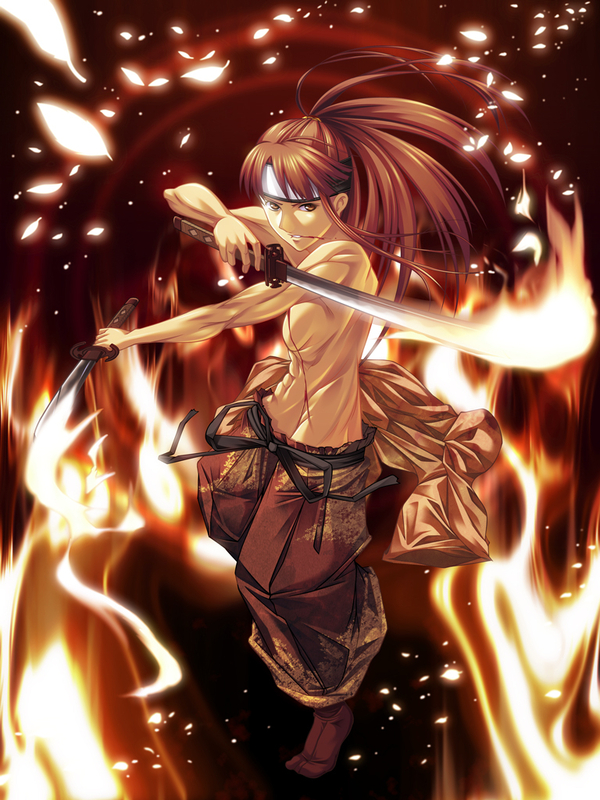 Result is creating a glowing hot edge to his blades that gives him an array of fire-based moves. Because he doesn't understand his powers (yet), he doesn't know how to wield them to his fullest. -Exploration is his biggest hobby. -He trains in spare time. For what purpose, is unknown. -He often likes to do odd-jobs for a quick dollar, or just for the heck of it. -He is a somewhat skilled swordsman, being able to wield two blades with efficiency. -Has some knowledge of herbalism, knowing of restorative properties of some kinds of plants. -In general, he knows a lot about how to survive in the wilderness. -Supposedly created a sport which involves hanging off the edge of cliffs, holding on with only your feet. No one else plays this, of course. -Is drawn towards activity and/or combat. He always takes the greatest risks and doesn't seem to value his own life. -Tends to fall asleep when being spoken to if it doesn't interest him, or even fall asleep during a boring battle. He sleeps a lot. -Seems to be "exceptionally" lucky.